Well, it came. Yep. The ground is dusted with snow and both girls have already downed at least one icicle “lollipop”. 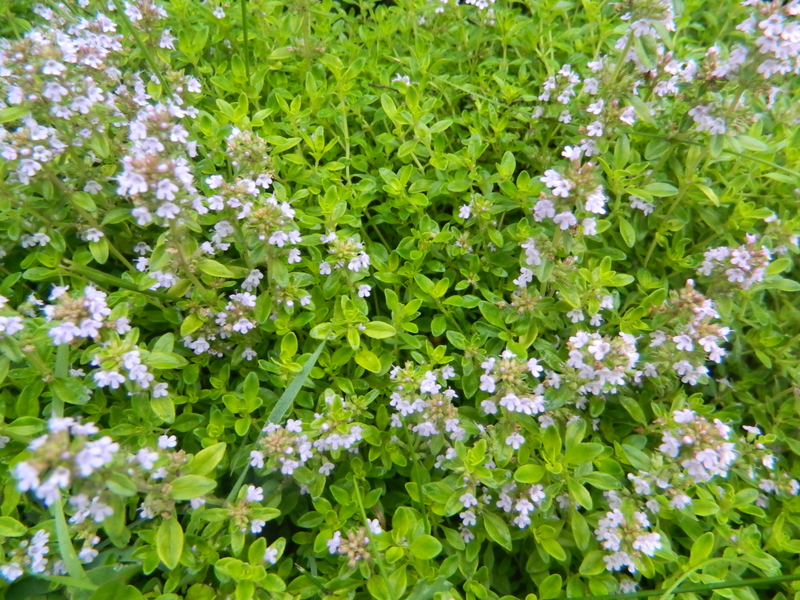 This means the garden season is officially over for me, as I harvested the last of my herbs this weekend to make herbal salt. Though I haven’t collected any scientific data on this, I think combining fresh herbs with salt preserves flavour better than drying them alone. 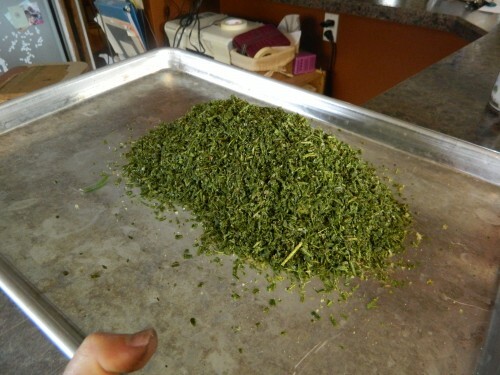 After removing the rosemary leaves from their stalks, I chopped them in my food processor. Knives work too. One day I’d like to make an un-recipe book filled with dishes that are too flexible to fit the recipe format. 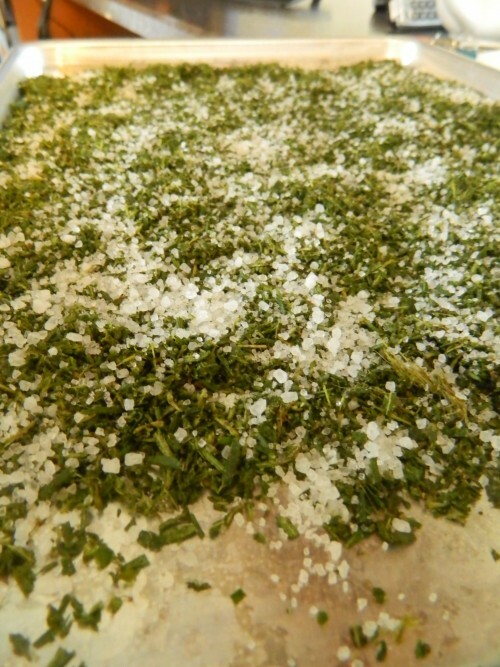 Herbal salts would definitely fit the criteria; you can use any combination of fresh herbs, with almost any ratio of salt. 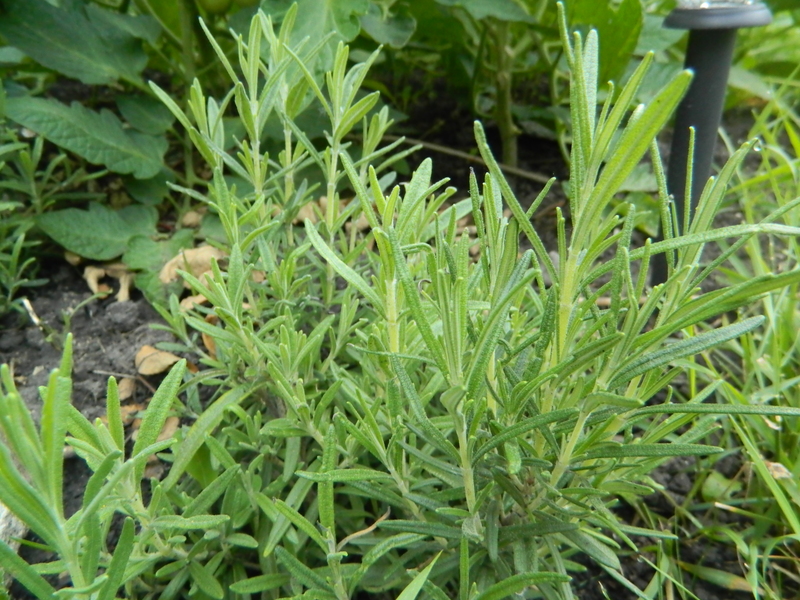 If you prefer, you can substitute salt with sugar (with lemon balm, lavender, etc)–I haven’t done this because I don’t use sugar in the same quantity I do salt. after a couple days? weeks? (when it’s dry!) store salt in your cupboard. I like to use jars with wide mouths so I can get my fingers inside them. You definitely want to touch this salt as you apply it. I made this batch earlier this summer. 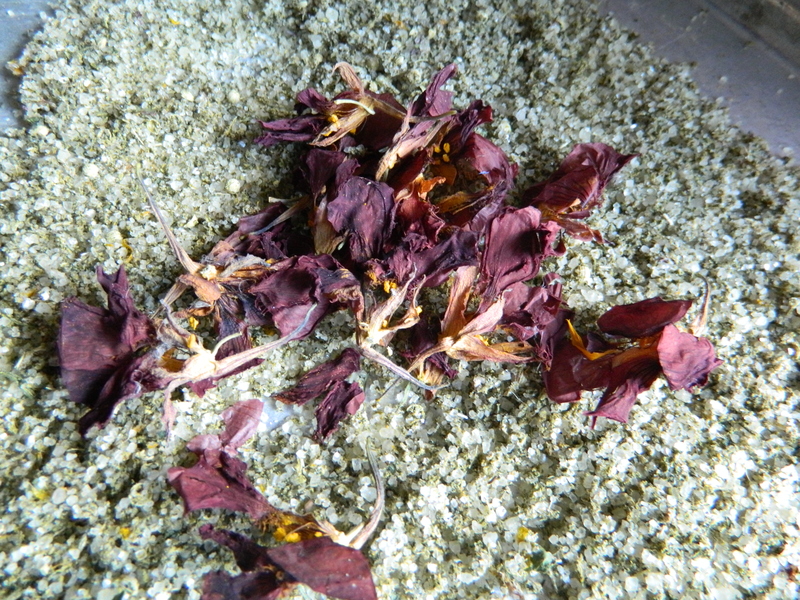 It contains sage, oregano, thyme, and as an after-thought, a few dried nasturtium petals to give it zip and colour. Thankfully, it looks like we’ll have enough potatoes around here, to eat with our salt, for quite awhile. Stan stepped out this weekend to buy some spuds and came back with eighty pounds! Fortunately for me, I think Stan feels some sort of responsibility for preparing them since he shouldered them into our basement. He made French fries for about ten people on Friday, and scalloped potatoes for thirty-five, on Sunday. Both days he served four. Our little family. Of four. I’m not complaining about the potatoes though. I’m actually grateful because they helped us through a slump of sorts. It wasn’t a food shortage–thank God for that–but a shortage of warmth and patience between Stan and myself. Last week was one of those weeks where we started off on the wrong foot and then hobbled our way through every day, a little more defensive and irritated than the last. Don’t you hate those kind of slumps? It wasn’t terrible, violent, or dramatic, but more like wearing a sweater with an itchy tag, all week long. By Saturday I’d almost lost track of what, precisely, was the main issue, because I was too busy noticing all the other little things that were wrong with Stan. Just as I was finishing with a Saturday-afternoon project, Stan started slicing up potatoes. At 7 o’clock he lit the barbeque. I looked out the window and saw it was sleeting. He came back in for the potatoes and carried them to a pot heating on the side element of the bbq. I watched him as he dumped the raw potatoes into the sizzling oil while slushy snow collected on the rim of his bowl and on his hair. 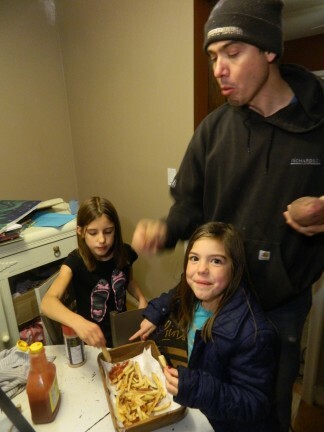 The girls jumped around him, hopping with the excitement of cooking french fries in the damp, snowy dark. And then, something slid out from under my tenacious mental grip. Maybe it was the how I’m hard done by card I’d been holding on to all week. Stan came in the house to hand me a bucket of crispy fries and went out to cook another batch. And another. And another. The fries were hot and salty and gluten free and better than all the McDonald’s fries I’ve ever had. Life is not an Amelia Bedelia story; food does not always solve the problem, but honestly, it really helped this time. Or maybe it was just the tipping point that led me to a healthier perspective. (Yes, I think I’ll go with that, it sounds more sophisticated than the way to a woman’s heart is through her stomach.) It probably didn’t hurt, either, that I’d picked up a book with a chapter titled “Incompatibility is Grounds for Marriage” earlier in the day. And let’s not forget I’m talking about Stan, here; he’s one of the most penitent people I’ve ever met, even if he doesn’t have anything to be penitent about. By the end of the evening, with our bellies full of simple carbs, we were ready to face another week together. This time, with our best foot forward. How do you get through slumpy, bumpy, itchy weeks? What’s your favourite potato dish? PS. IMPORTANT! YOU DON”T WANT TO MISS THIS! Announcing…. my first ever blog give-away contest. Instead of leaving a comment, all you have to do is show up at my backdoor to claim your prize (a hearty serving of scalloped potatoes ready to go!) …This is not a joke. A blog isn’t an appropriate place to describe the kind of mothering I did last week. But if you stop by for a cup of tea, and we sit on my back stoop covered with tattered green carpet, I’ll tell you all about it. About what happens when I speak in a low, calm voice and keep my cool and reason and explain and empathize and offer options and then… S-N-A-P! Yes, just like that. Only louder, and more out of control. She called me back sixty seconds later, and I asked her for parenting advice. She resisted. I demanded it. She gave in. After I hung up the phone, I told my daughters about the predicament I was in; how I wanted to take the high road, and not lunge at them or invent punishments in fits of frustration. “Wouldn’t it be lovely if we all listened and cooperated with each other just because we love each other?” I asked them. 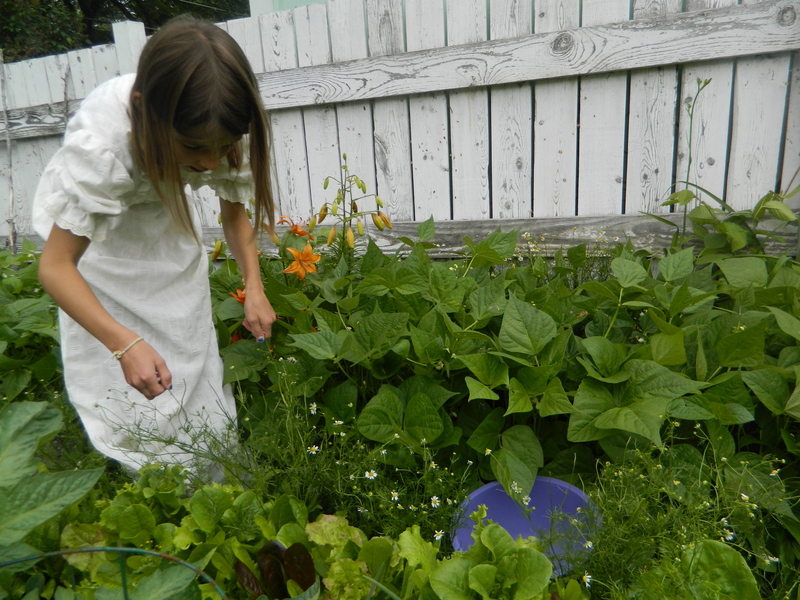 A 1970’s bridesmaid dress is perfect garden gear, don’t you think? By the end of the day I came up with a hybrid parenting plan; part high-road (less threats, more discussion) and part low-road (we all agreed we weren’t evolved enough to do away with punishment/consequence). Together we talked about all the yelling, complaining, fighting, unwillingness to clean-up and tried to think of a solution. (That was the high-road part–just in case you missed it.) Then we decided the girls have three chances per week to balk at chores, or be entirely unreasonable, before they lose their allowance. So far it’s working. But then again, most things work at the start. I’m hoping some of you who have adult children are reading this with knowing smiles, thinking “this too shall pass.” But the thing is, sometimes it doesn’t pass. Sometimes parenting is hard until the bitter end, and the heartache only grows deeper as the child grows older. I met a beautiful lady recently who told me her parenting story; one filled with doctors diagnoses, psychiatrists, arrests, and homeless shelters. She explained that she’d parented both her daughters the same–from pregnancy to adulthood–but one of her girls chose self-destruction at every turn, while the other had become a well-adjusted, loving mother of her own children. Then in mid-sentence, the lady I was visiting with interrupted herself and forced a laugh. I could tell she was embarrassed she’d shared as much as she had. Since our conversation I’ve thought of this woman almost every day. What do you say to a mother whose prayers have seemingly been unanswered for thirty years? I said nothing. Well, actually, I’m sure I said something to try to smooth the social wrinkles, but in my heart I knew it was nothing. Not for someone whose parenting path had taken her places she never imagined going. In other, not so emotionally taxing fronts, I’ve been experimenting with homemade mosquito repellent. 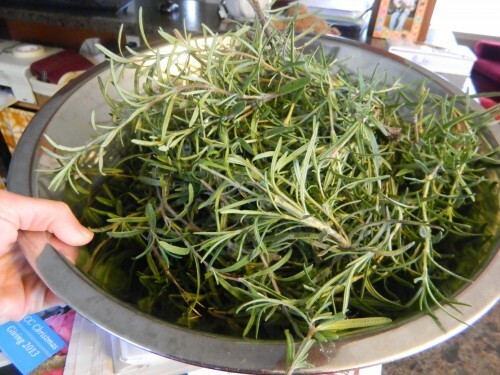 Inspired by the legend of the vinegar of thieves, I searched the internet for some recipes (like this one) and then I set out to make my own repellent with herbs I had on hand. 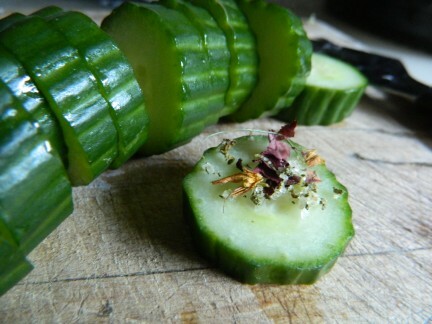 I stuffed herbs into an old pickle jar and covered it all with apple cider vinegar. Then I let the jar sit in my cupboard (shaking and stirring it daily) for about three weeks, before I poured the strained vinegar into a spray bottle. At this point I also added a few drops of lavender and peppermint essential oils. 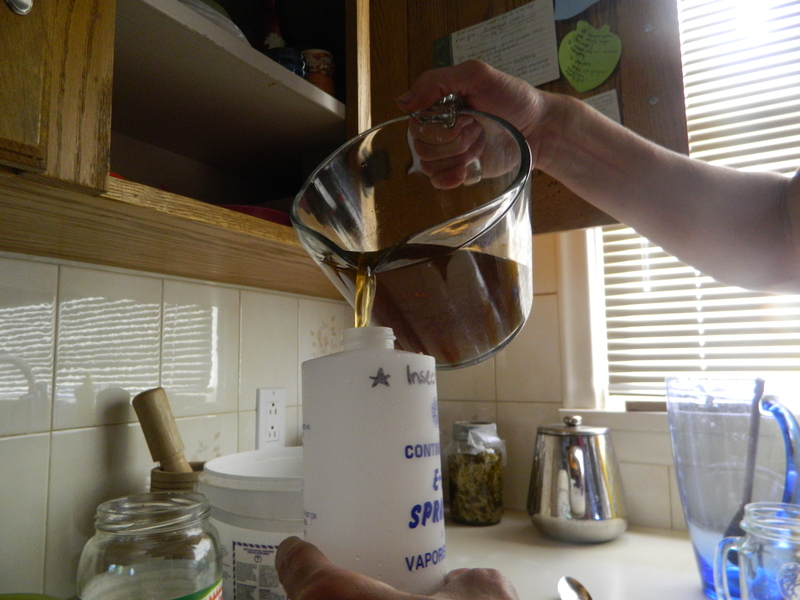 I diluted the vinegar solution with equal parts water then put the mix and concentrate in the fridge. 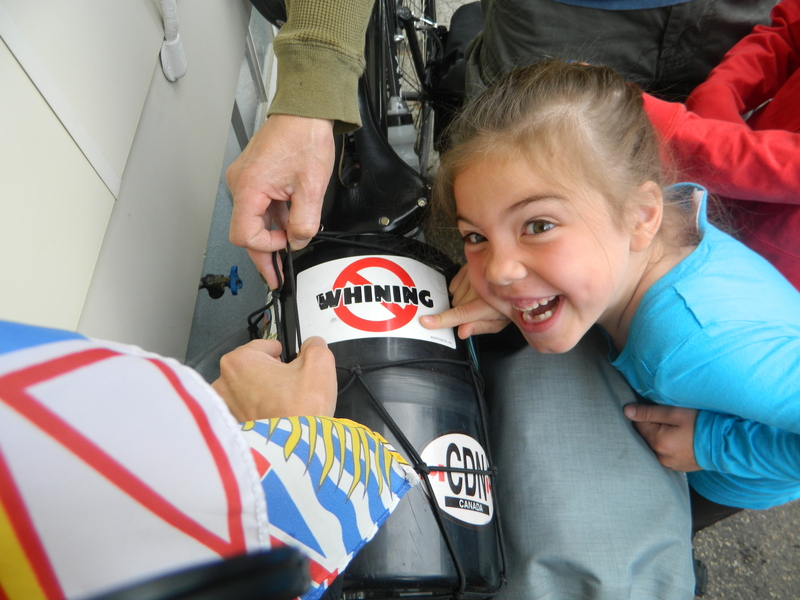 Susanna grinning beside the sticker on Jesse’s bear cache: NO WHINING. Perhaps we should make t-shirts with that logo, before we go. 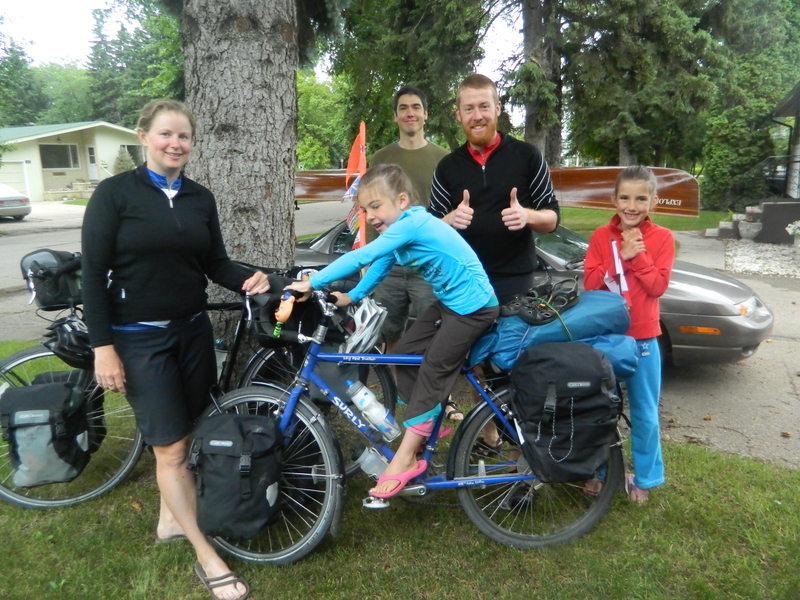 Wishing you courage in all your parenting/biking/outdoor/life endeavors this week. If you’re like me, you’ll probably need it. 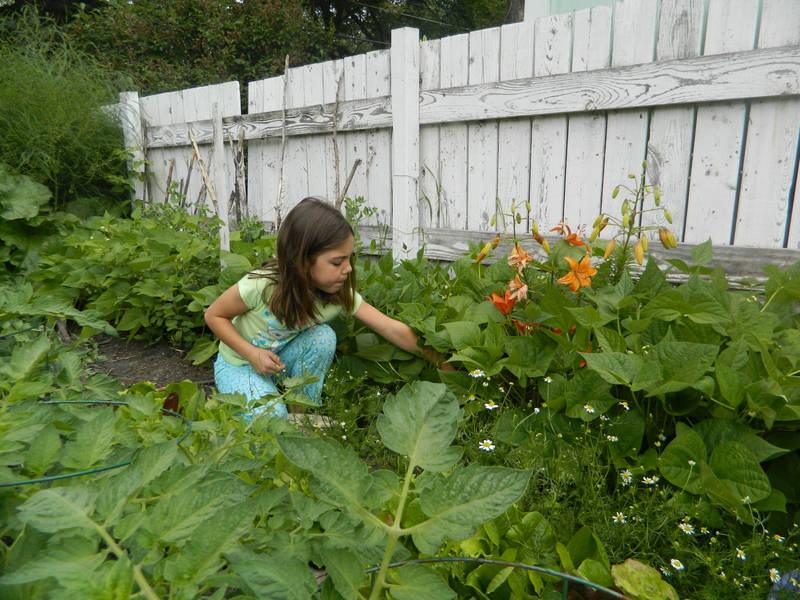 I used to be so hopeful when planting my garden. I’d think about all the seeds ready to burst forth and imagine my plot carpeted with showy foliage. Every May I’d wonder if I should contact the local horticultural society to register my garden for the annual tour. It’d be a pity not to show this off, I’d think to myself. Then June would come. And the weeds. And the slugs. And the blight. And who knows what else. These days, as I seed my garden, I’m more pessimistic (realistic?) about the whole thing. When something actually surfaces–and stays alive despite ragged holes crunched out of leaves–I’m blown away. 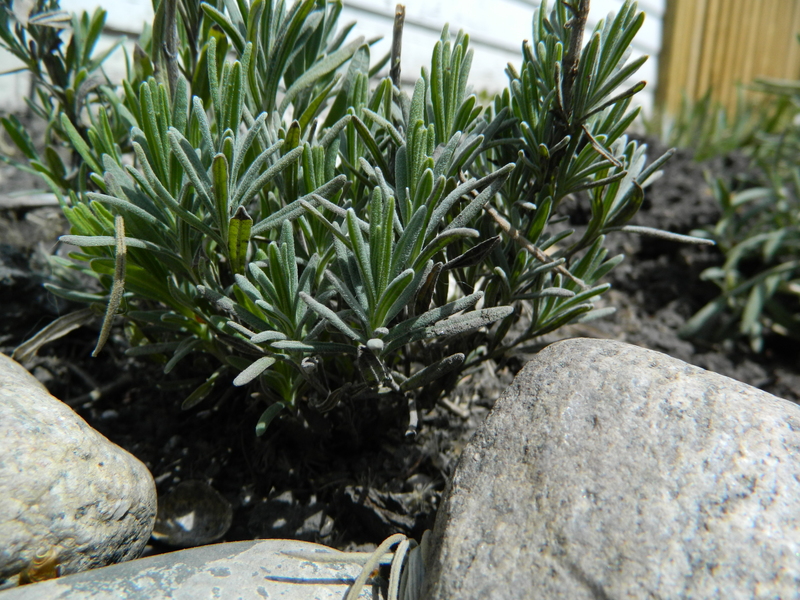 Flourishing, heck, even surviving, plants are a miracle. 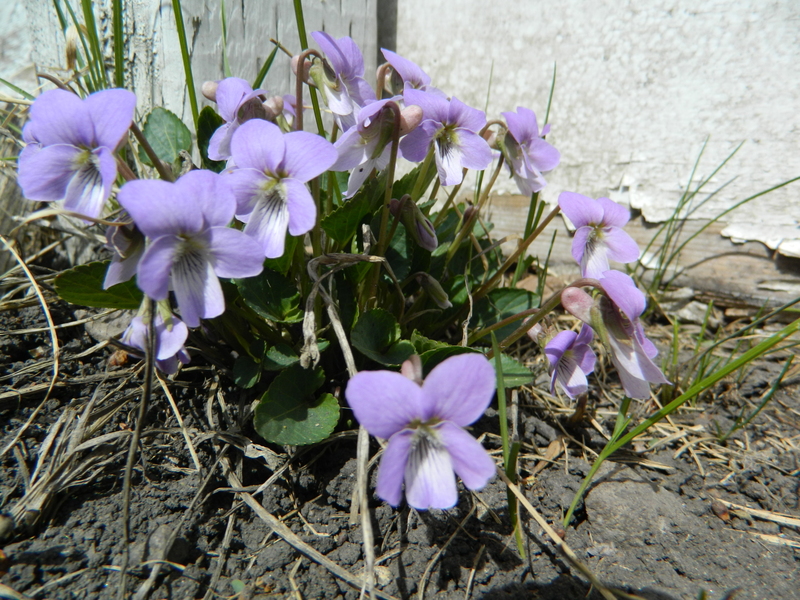 I tell my girls they can pick these violets (edible and medicinal) only if they promise they’ll eat them. Someone asked me recently if I’d planted my garden already, after telling me she’d planted hers on Saturday. I looked at her hard and realized she meant something totally different than what I’ve been doing over the last few weeks. I clued in when she said she’d finished seeding hers in a day. I imagined her drawing the hoe through deeply tilled soil, getting crumbly black dirt in the heels of her shoes as she dropped seeds into neatly spaced rows. My way of planting is a back-breaking, multi-day procedure. First, I yank out all the sunflower stalks and other woody material I didn’t clean up before the snowfall. Then there’s the seed bed preparation: I hack at the clay with my pitch fork (no tiller for me, no siree, that would be too easy) and then rub the hard lumps of clay into mini lumps of clay until my hands are raw. 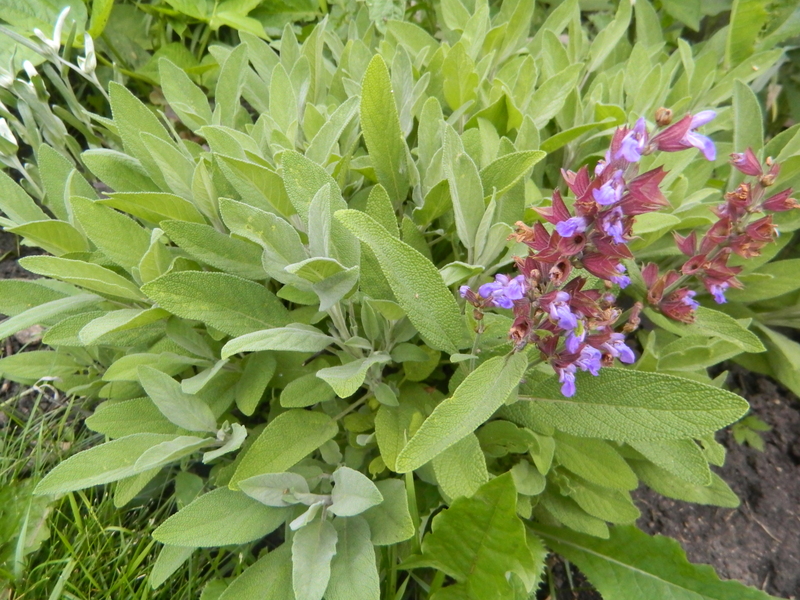 I plant wild, row-ish looking things that wind around scattered perennials and fall-planted vegetables. Sometimes this works. Other times it turns out like the arugula bed I seeded a few weeks ago. The seedlings managed to bust through the crusty soil, and before they even developed their first set of true leaves something devoured every green speckle, in just two nights. 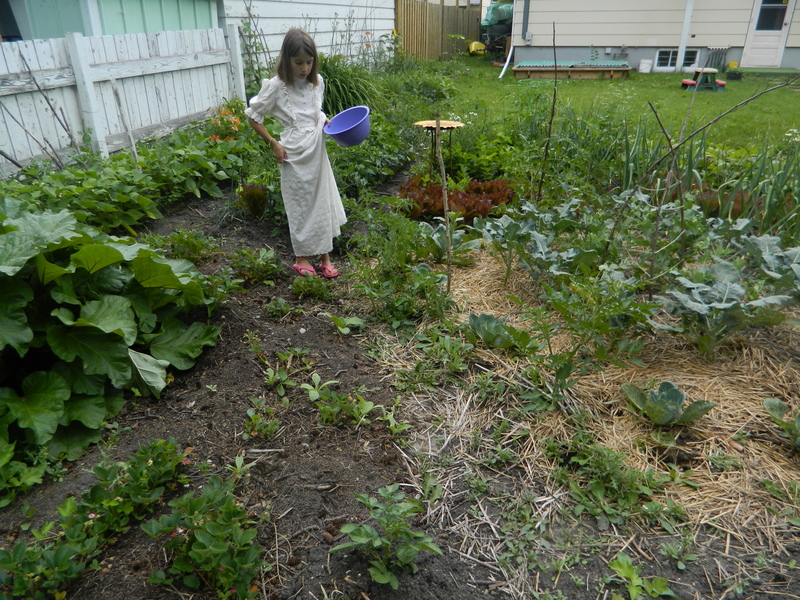 My friend, Bonnie, says the deer are noshing on her new raspberry canes and special-ordered fruit trees. No, this gardening thing is not for the faint of heart. 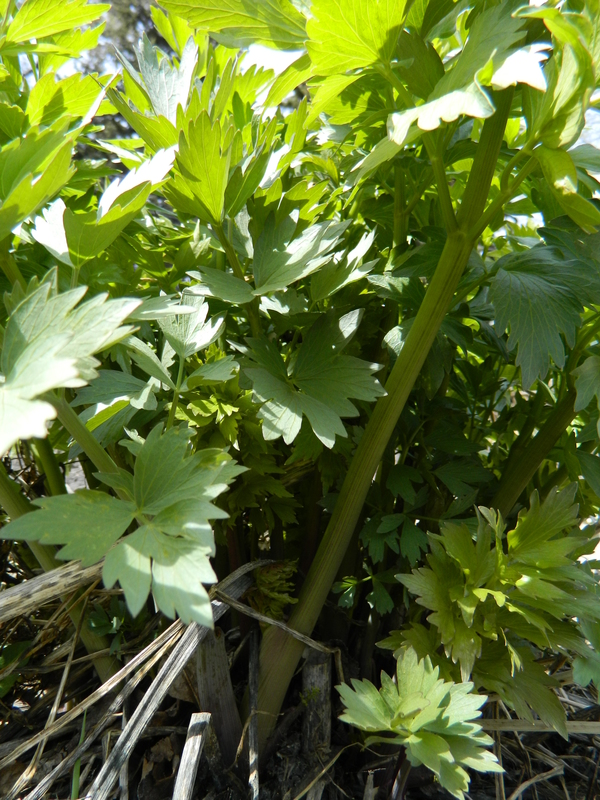 Lovage–a celery replacement great for soup bases. I know I’ve said chamomile is the hardiest thing I grow, but I was wrong. It’s lovage. Too bad we can’t survive on it. 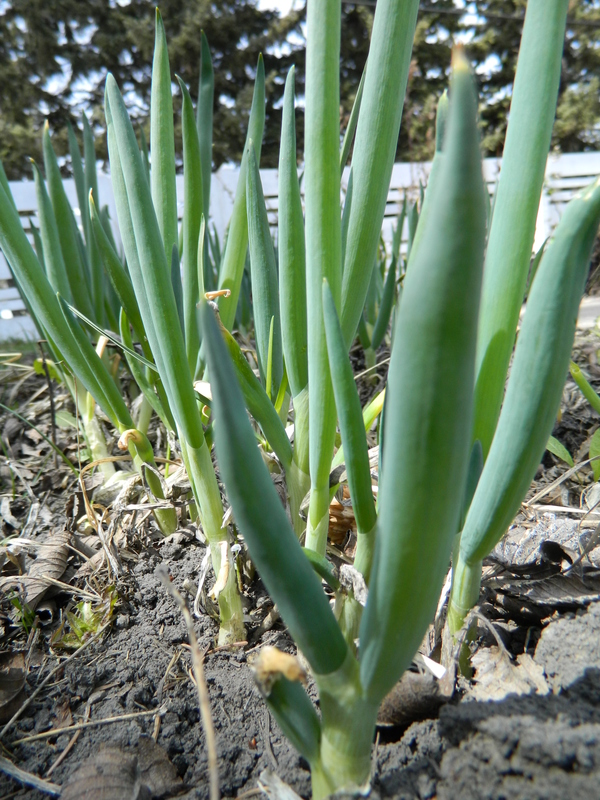 Perennial green onions. They are one of my first edibles and can be harvested multiple times, producing all summer long. They are also shade tolerant. So here’s the little good: hardy perennials and wild finds. My perennials are mostly berries, herbs, and edible flowers and every spring I wish I had more. (All the above pictures are perennials.) When I’m sweating over my lumpy soil, the rhubarb, mint, and raspberries are already unfurling leaves, all on their own. Too bad there isn’t a winter-hardy tomato perennial! 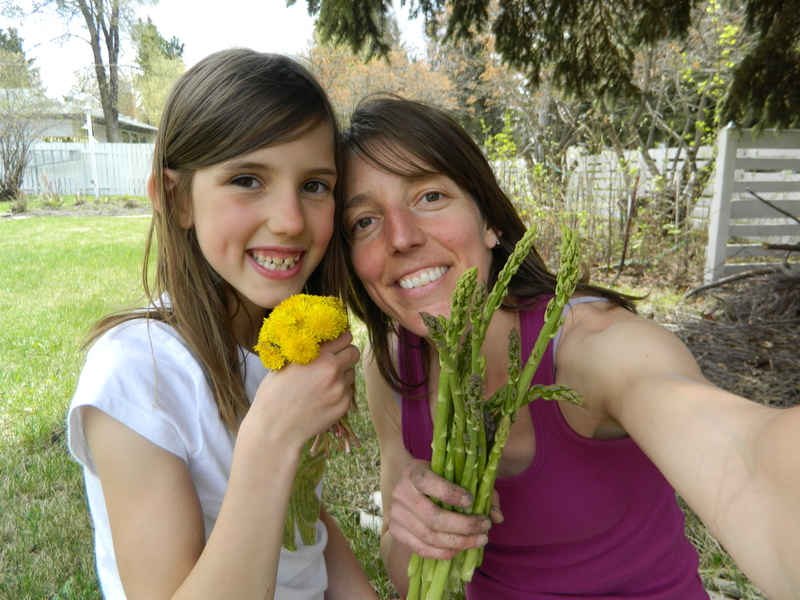 As for wild finds, we ate our first harvest of wild asparagus this week. I located the greenery last fall (see picture here to scope out your own) and marked the spot: third spruce tree along railroad tracks. We found it last Wednesday and we’ll go back for our third cutting today. So, if you see me walking around town with a knife, you’ll know what I’m up to. 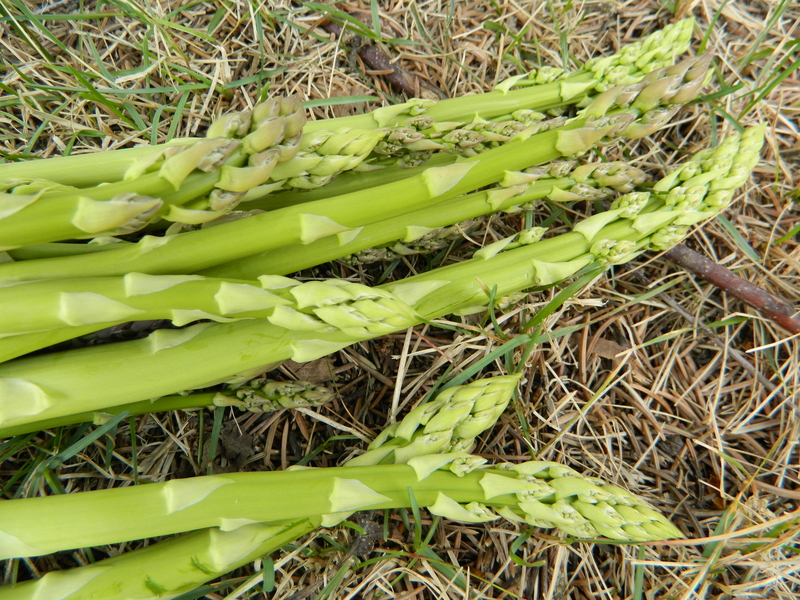 Wild asparagus–I leave the thin stalks to support root growth and only harvest ones thicker than a pencil. 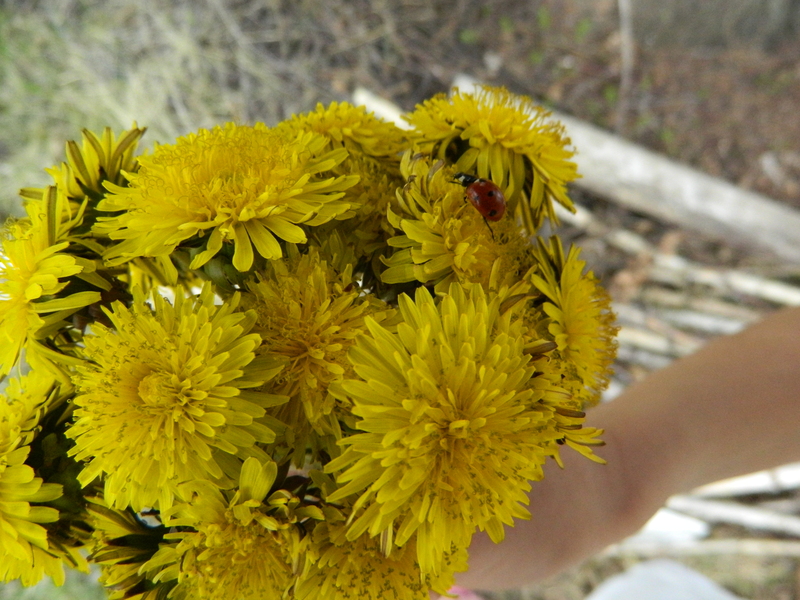 Belén collected dandelions on the way to the asparagus and termed the whole excursion a “real success”. I think this was mostly due to the dandelions. So, all I can say is best of luck with your gardening endeavors! If you can nudge a piece of land towards production you’ve got my admiration. (Dirty) Hands down.